The Floating Harbour Transhipper (FHT) is a pioneering logistics solution that was designed to meet the growing demands for coastal transhipment in the mining sector as well as commercial port operations. Addressing the two key needs of military and disaster response capabilities, Sea Transport Logistics Pty Ltd. have incorporated the successful aspects of this design and developed two complimentary designs. 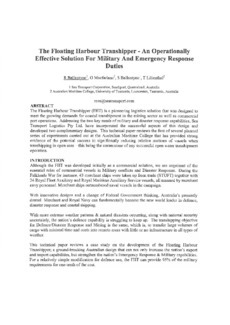 This technical paper reviews the first of several planned series of experiments carried out at the Australian Maritime College that has provided strong evidence of the potential success in significantly reducing relative motions of vessels when transhipping in open seas - this being the cornerstone of any successful open water transhipment operation.